Need a florist to send beautiful fresh flowers to Mater Hospital Sydney? Our award-winning flower shop offers same delivery if you order by 11am weekdays and 9am Saturdays. Pure Flowers, an award winning florist, has been delivering stunning floral designs to local North Shore hospitals since 1995. We always enjoy creating and delivering flowers from our boutique North Shore florist to the Mater Hospital Sydney. We are known for designing the loveliest, long lasting bouquets and floral gifts for every occasion - 'Congratulations' to the new mother and father on the arrival of a baby boy or girl, "Get well " or "Just Because" with flowers. If you need a same day delivery service from our floral shop to the Mater Hospital Sydney you need to order online by: 11am - Monday to Friday and 9am - Saturday. If you would like to send your get well message with flowers or to congratulate the family on the arrival of a new baby, we will happily send your flowers to the Mater Hospital. Sydney. Most wards accept flowers with the exception of ICU. Please note that potted plants are not permitted at the Mater Hospital. We have a wonderful selection of flowers for you to choose from - luxury flower boxes, bouquets and blooms in a vase. Read our blog for a few more ideas on the best flowers for a hospital bedside. Whether you call or buy your flowers online, our team will create your order in our floral boutique. Read our flower care tips so that flowers can be enjoyed for longer when they are brought home. 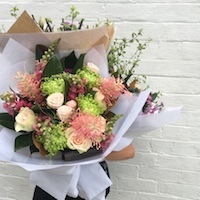 Whether you pop in to see us or buy your flowers online, our team will craft your order in our boutique. One of our friendly couriers will deliver your flowers to The Mater in Crows Nest, North Sydney. We look forward to sending your flowers! The Mater Hospital is located on the lower North Shore of Sydney. We look forward to sending your flowers to the Mater Hospital Sydney!